We’ve had several fans reach out to us about getting started with DIY projects and basic homesteading. Many want to know what are some of the best projects to start first. Our answer is always the same: do what inspires you most. If you do what you love and value the reasons you’re doing it, you’re most likely to be satisfied with the results. Sometimes getting started on a project and collecting all the items can be an obstacle, especially for those short on time. That’s why we wanted to introduce fellow DIYers, homesteaders, and crafters alike to Easy Home Made’s monthly craft kits. They sell a monthly subscription of creative and fun DIY projects, most of them kid-friendly and all of them perfect for individuals, a bridal shower, or just a girl’s night out get-together. 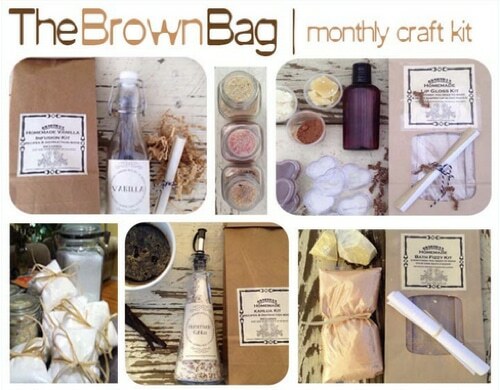 When you subscribe, you’ll receive in the mail a nicely packaged brown bag of the items you need to make and assemble your project. Easy Home Made offers a variety of awesome projects! We’ve enjoyed two of their kits and loved them both.